by Ed Kasper Licensed Acupuncturist, Herbalist and 25 years of Kombucha Brewing and as a consultant to Kombucha Brewers worldwide. Draw off some fresh brewed Kombucha Mushroom Tea. Replace what you just drew off with some feeder solution (sugar + tea) that you smartly prepared ahead of time. and Voila ready for another day. You can keep fresh sugar + tea feeder solution in the fridge for several days, and use right from the refrigerator. Taste & Benefit - The Optimum Kombucha Brew. Continuous Brewing is the easiest and simplest way to make Kombucha Tea. All one needs is a 2 gallon or larger container. Other equipment, as shown on our left hand column, and explained below, make life simpler. Our recommended tools of the trade. Follow our basic Kombucha Recipe. Once you have fermented your Kombucha tea to its proper level, all you have to do is to replace that which you drink with fresh sugar & tea feeder solution. Adding new sugar and tea may be done each day, or every other day and sometimes on the third day. Advantage of the Continuous Brewing Method is that the optimum health benefit of all the nutrients are readily available. There is no need to do weekly cleaning, no need to remove or worry about the kombucha mushroom, and mold is far less likely to form. Since you are simply maintaining a consistent established ferment, your brew is far less likely to be influenced by wild or airborne bacteria and yeasts. In kombucha fermenting, as in beer, wine or vinegar, the initial phrase, is the most critical and the most likely time a batch may go off in a unwanted direction.Only Continuous Brewing of the kombucha allows the formation of the vast array of the many nutrients and acids that are constantly being produced and broken down throughout the active ferment time. Kombucha Researcher Mike Roussin indicated that at 80o F and 7 days the ferment has the greatest variety of health benefits. (vitamins, oxylic acid, etc) However, he also noted that the longer the ferment was allowed to proceed the more beneficial acids will have a chance to form. Some of these acids don't even appear until 14-21 days in the typical process. These acids are largely responsible for the detoxifying nature of Kombucha Tea and are the catalysts we seek in kombucha mushroom tea. Glucose content maximizes around the 8th or 9th day. This implies that gluconic acid production could not peak until after that point. Gluconic acid is the biggest single contributor to the detox effect. Where the typical Single Stage Method, in the hands of a brew master, may be able to develop a high level of a single nutrient or two, the Continuous Brew will always produce the widest range of all the nutrients possible. One common question is if I put fresh sugar in - wouldn't' I be drinking a lot of sugar? In starting off a Continuous Brew a initial longer brewing say 20-30 days, may deplete the total fermentable sugar or reduce the caffeine content, but the taste (unless finely filtered or diluted) is pretty much undrinkable. Even lower temperatures and longer brewing times do not translate into greater benefits. see our Time & Temperature article for the effects of temperature on a ferment. If you are a diabetic be aware that there is sugar left in the brew. This may be tested by a Hydrometer or a Residual Sugar test Kit. Unlike a Single Stage ferment where every batch has to be tested due to the dynamics of a continuous ferment your brew will be more predictable and reliable and therefore less testing would be required. First off, since you control and establish the degree of the ferment you are aware of the amount of sugar available. When you draw off your kombucha mushroom tea to drink you don't add the fresh sugar and tea feeder solution until after you draw off what it is you'll be drinking. When you add this fresh sugar it is only at the amount you have removed. Typically this is from 10-20%. Secondly you are giving the ferment 24 hours to process (ferment) this sugar. In the Continuous Brewing Method you have a large amount of hungry yeasts and bacteria just waiting to pounce on a small amount of sugar. Unlike a Single Stage Ferment, where there is a "lag time" and the yeasts have to become accustomed to their new environment, the Continuous Brewing Yeasts are ready to go and waste no time. How much Sugar is in a daily glass of Kombucha Tea from my Continuous Brewing Method vs my friends typical 14 day ferment. Now that you established that not too sweet / not to sour balance in your initial ferment, you can start the Continuous Brewing Cycle. Roughly the typical average Kombucha Tea contains about a third of the amount of sugar you started with. As mentioned above you can measure these levels via a Hydrometer. To maintain what you have - which is the secret of Continuous Brewing is to replace what you drew off. 24 hours later you will be back to that same initial draw off. The Sugar and other levels will be roughly the same. Its fermenting faster (24 hour period) because now there is greater microbial activity. 90 X more at work.Becasue you are drawing off 10 %. there's 90% more microbes available to work on only a 10% fresh solution. This is compared to a typical ferment where you start off with 10% starter and 90 % feeder solution (Sugar and Tea) . This starts as 10% microbes feeding on 90 solution, which takes so much longer. The Time is a ratio of the Temperature. Temperatures in the 60's or lower will foster the wrong yeasts and bacteria. The good probiotics associated with kombucha tea will become dormant and ineffective. We suggest a heating pad like those shown on the left to help maintain positive temperatures. Our Blue Pad is rated at 25 watts and is recommended for colder climates and will raise the ferment around 10 -20 degrees over ambient temperatures. Our Black Pad is rated at 17 watts and is better for warmer climates where only a slight raise of 5 degrees F (2C) temperatures is all that is needed. Either unit may be used with the optional thermostat control for accurate temperature controls. The thermostat is handy on the 25 watt pad but not for the 17 watt only because the temperature variation is limited to 5 degrees. At 75 F. temperature the ferment reaches the sweet - sour transition in 8 to 14 days. Even this lower temperature still does not produce some of the acids in the longer amount of time it works. At 80 F. 6-8 days the optimum balance is achieved and is now considered the normal brewing cycle where taste and benefit may meet. Kombucha will ferment well at 30c, (86F). At this elevated temperature the ferment is considered complete at about 4 to 5 days, However it does not allow some of the acids that form during longer fermenting time to occur. Some of these acids are quite beneficial and are a desired outcome of the ferment. At 103 F. die off starts. Lower temperatures (70's) and the kombucha tea is lighter in taste and texture. Higher temperatures (80's) and the kombucha tea is stronger tasting with a heavier body. Of course the tea and sugar used will be a major influence but the temperature has a significant influence on the overall character of a kombucha tea. Kombucha Mushroom Tea is ready when you are. That is to say that as a tasty beverage you may drink it anytime. So brew it to your taste. The longer it ferments the more sour it becomes. So if its too sweet allow a few more days to ferment. The health benefits may be a different reason for establishing the taste (sweet/sour balance). Fortunately those are typically at the semi-sweet taste that appeals to most people. But you can go to your preference and enjoy life a little bit more. The same safe food rules apply. Looks Good (no fuzzy or dry powdery growth), Smells Good (pleasant, slightly vinegary no medicineny or nail polish aroma) taste Good. food grade plastic may be used. These may be identified with the number 1 or 2 inside a triangle on the bottom. Or a Oak Wood (vinegar) cask. Select a distinctive and easily accessible home for your Continuous Brewing Container. Be sure that the spigot is accessible. Setting the Continuous Brewing Container upon a raised platform makes life easier. You'll want to easily fit a cup under the spigot. Clean everything with white distilled vinegar or alcohol or use an Iodophor Sanitizer DO NOT USE SOAP. Just about any water is OK except for water that has chlorine or harmful chemicals (fluorine). Decide how much kombucha tea you want to maintain. 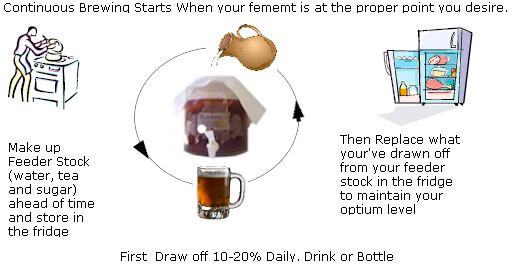 As a rule of thumb figure you will be producing 12 - 25 ounces of Kombucha Mushroom Tea per gallon of ferment per day. Therefore a 2 gallon ferment will produce twice that or 24-50 fluid ounces of kombucha tea every day, and 5 gallon ferment will produce 5 times that or 12 x 5 = 60 fl ounces a day. You don't have to personally drink it all by yourself you can share with friends or even bottle for latter. Check for leaks BEFORE you fill with your ferment. we suggest to use a bit of white distilled vinegar or some old kombucha tea. Swish around and lay the container so that the spigot is submerged and wait and hour or so then check the outside for leaks. For the wood casks follow the directions included. Which usually call for filling with cold water and allowing the wood to swell for 24-48 hours. The same would apply for the Oak casks that are plastic line or was sealed. Never fill the container to the brim. Only fill about 3/4 or so, leaving room for the mushroom to grow and for the exchange of gases. Evaporating gases may condense on a low hanging cover causing dampness on the cover and thereby possibly contamination. tea 3-5 grams, 2/10 ounce, or 2-3 t-bags, or 1 heaping teaspoon, or personal preference. Add Tea steep for recommended time dependent upon tea. Remove t-bags. Some people only seep their tea for a few minutes others allow it to stay over night. Many people choose their tea based upon the medicinal value of the tea. Research indicates Pu-erh Tea is beneficial in intestinal disorders. White Tea is higher in anti-oxidants. Rooibos caffeine free. Black tea is traditional Kombucha Tea. cool down Do not add Hot feeder solution to the fermenting Kombucha. Best to add at room or same temperature. note The feeder solution may be made in larger batches and stored in the refrigerator until ready to use. Fresh Sugar and Tea should last a few days refrigerated but I do not know exactly how long it would remain good for, so be careful. First Draw off the fermented kombucha tea and then add the Feeder Solution. This allows the fresh sugar and tea to be processed. Stir the brew when adding fresh Feeder Solution Solution. Do not worry about disturbing the kombucha mushroom. Kombucha Tea needs oxygen to ferment properly. This also mixes the old ferment with the fresh solution. Of course every time you disturb the brewing process the mushroom or SCOBY has to start forming all over again. But here we are after the liquid tea not the cellulose which forms the SCOBY or mushroom. Creamy smooth SCOBY usually seen in the single stage method do not form as well in the Continuous Method. So don't let your friends peek in ! OPTION: to add fresh feeder solution without disturbing the mushroom: First cut a small hole in the mushroom, maybe in the center. The hole should be the size of the end of the funnel. Any funnel will do. It should be one that is comfortable to use and one with the material you are happy with. In our opinion, the material does not matter as the feeder solution will quickly pass through and not have any time to interact. The goal here is to disturb the mushroom as little as possible and he mushroom to maintain its seal around the container. In Continuous VInegar Production Method the funnel may remain in place as alcohol is added and acts as a cleaner and preservative. With Kombucha the feeder solutionis sugar and tea and will draw pathogens, so has to be cleaned after use. Use distilled vinegar to clean the funnel. The key to Continuous Brewing is maintaining the level of Kombucha tea that in character and taste is just right for you. There may be times when you have extra and want to bottle some for latter. (see Bottling Tips) You may also decide to do a Secondary Ferment and get more creative with your brew, even making up different flavors and spices. see Adding Herbs and Spices to your kombucha tea. Your ferment taste and character will stay just about the same for 3-4 days but beyond that begins to age and sour noticeably. That may be a good opportunity to bottle off most of your brew and to start a fresh full batch the day you leave. Plan on a 8-14 day day cycle before the new batch is ready. Now if you find the batch is way too sour, get a large pot and pour off 1/2 of the sour batch into a clean pot and set aside. Boil up a new batch of sugar and tea equal to what you just removed. When cooled begin slowing adding the fresh sugar and tea back into your sour ferment until the taste begins just slightly too sweet. If you over sweeten you ferment then put back in some of the sour stuff you set aside. The next day your ferment should be back to your taste and character. The really sour stuff has many benefits so don't throw it away. It makes an excellent foot soak, skin splash and hair rinse. You can even wash your dog in the sour stuff and it will freshen them right up. To review. The key is to maintain what you have. You accomplish this by removing some (drinking/bottling) and by adding some fresh sugar and tea back (feeder solution). If it gets too sour simply remove more (see what to do with sour kombucha) and add fresh Feeder Solution. Now if you overly sweeten the ferment you have to wait a bit until the taste is again to your liking. Or add some sour kombucha that you may have stashed away earlier. CleaningAt some point you may decide its time to clean out your brew. It may be that the the yeast are over populated, the taste is thicker, yeastier, and/or the spigot is clogged. Sometimes you can use a small tube and hold it to the spigot and remembering to open the spigot, as you blow and unblock the spigot. The MushroomAt some point the mushroom may just become too large or too scary :)). The mushroom itself is important to a kombucha ferment as it contains more of the bacteria and serves as protection and direction for the bacteria. So up to a point, more mushroom is better. In my opinion a one to two inch thick mushroom is good. I routinely reduce anything over that amount. You can cut, slice or dice the mushroom with any instrument or even with your hands. How you do it relies on your personal choices, as the mushroom is not adversely affected with only a brief encounter. Remember that you should always have a spare mushroom and some starter tea safely stashed away in case disaster should strike. Filtering To clean or filter your brew. You only need a large container and some cheesecloth. Using a strainer (metal or plastic) helps hold the cheesecloth in place. Using the cheesecloth, strain the ferment. Leave some ferment in the dirty container and use that liquid to clean the inside. Toss out the dirty ferment. Pour some of the filter kombucha tea back into the original container to use as a final rinse. Swirl around and toss out. Return the ferment to the container using another piece of cheesecloth to again filter the ferment. Secure the cover and you?re ready. Going on Vacation Good time to bottle and preserve your brew for latter. Leave about 1/2 a gallon (2 quarts/2 liters) in the container. This will continue to ferment and be nice and ready to use as the starter for your new brew when you come back from vacation and are ready to resume brewing. Simply follow the Basic Recipe. Alternatively if you'll be gone between 1-2 weeks the you may decide to go ahead and draw off and bottle and begin a fresh new batch. Depending upon temperatures the typical ferment will take 8-14 days, so you can plan to have a nice brew when you get home. note- for safety reasons I do not recommend leaving any heating pads on when you are on vacation as it may pose a potential fire risk. (as is true with coffee makers, etc) If the weather is hot, leave enough liquid in the container to account for any evaporation.Typically a continuous brewing ferment remains relatively constant for about 2-3 days and slowly changes towards the sour side steadily thereafter. Whenever the brew becomes too sour, simply pour off more of the sour brew replacing with sweet feeder solution. note- one idea is to pour off a quantity of the sour tea into another container. This way in case you take out too much you can pour back in some to balance the brew.